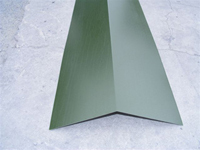 Our ridge flashings are 3 metres long and have a girth of 200mmx200mm with an angle of 135 degrees. 3 metre long ridge flashing. 3 metre long galvanised ridge flashing.